Small birds routinely land on utility poles and wires in complete safety, since they touch only one wire at a time and are not grounded. Large raptors, such as red tailed hawks, often use electric poles as hunting perches, and, only rarely brush a wing against a second wire while clutching the other. However, the common pole mounted step-down transformer, usually found in front of rural homes, may not be as safe a perch. 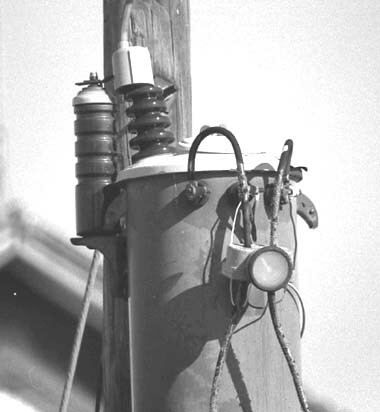 Such transformers have two terminals on the upper end which are only inches apart, just the right distance for a large hawk or owl to grasp. Barn owls have nested in one of our chimneys for the past six years without incident, even though such a transformer is only ten yards from their nest. However, this year, during the nesting season, one of the pair was electrocuted. Luckily, seventeen days later, a new mate was present and a second nesting begun. Our local electric company promptly responded to our request to make the pole safe. A plastic bird guard was fitted over one of the terminals. However, they didn't go for the idea of retrofitting all of their transformers in this manner. Transformer terminals are apparently not a favorite perch for large birds. It took our barn owl six years to make it's lethal connection. However, many other instances of powerline electrocution of hawks and owls have been documented. If your property attracts raptors, a bird guard should be fitted to any nearby transformers. 2014 update - The transformer shown above failed several years ago and has now been replaced with a modern one, but still has the bird guard on top.